When, in the course of packing for vacation, it becomes necessary to remove Zucchini from one’s suitcase more than once, it can be assumed that the Zuke is suffering from separation anxiety. Zucchini, our Abyssinian/Bengal feline, doesn’t worry about much. She doesn’t think about the food she’ll eat. She doesn’t worry about the clothes she’ll wear. Or where she’ll sleep. Juxtaposed with the cares that we mere mortals contend with, Zucchini leads a carefree life. The same is true with my other five cats, and I’d venture to say, it’s the same with your pets, too. We pet owners know this truth to be self-evident- our fur babies don’t worry. When I’ve been gone all day or away on a trip, the moment I come home, she runs to meet me. Maybe she grumbles a bit with a few mews, but then it’s all about the pets. Heck, sometimes she will climb on me during the night or in the early morning because she’s been denied her pets for too long. She wants her selah moment, and sometimes she can be downright demanding about it. And there’s a profound lesson in that. Selah is most often encountered reading through the Psalms. David used it generously, and given the tumult that shepherd boy turned king encountered while he walked the earth, he needed his selah moments, indeed. But what is selah exactly? Is it merely a metrical device? A look at the Hebrew illuminates the purpose eloquently. Selah is comprised of three Hebrew letters. Samech Lamed Hey. In the Hebrew alphabet, each letter has a corresponding pictograph that gives greater depth of meaning to the word. Samech is a picture of a thorn. The understanding derived from the thorn is multi-fold. In Israel, shepherds used thorn bushes to build walls around their flocks at night to shield them from danger. However, thorns grab hold. They imbed in your flesh; they get under your skin. Thorns are tenacious. Lamed is a picture of a shepherd’s staff. A shepherd uses his staff for three main purposes which all illustrate intimacy. The first is during lambing season. Ideally, a shepherd wants to be present during each birth, making sure the ewe has not complications, but also to ensure that the lamb finds its mother. In a large flock, the lamb can become confused. When that happens, the shepherd hooks the crook of the staff around the lamb, lifts it up, and deposits it beside its mother where it can suckle. The second purpose of the staff is pluck a sheep from the group for closer inspection. The third purpose is for gentle guidance. Sheep have a tendency to wander, and the shepherd uses the staff to keep the flock together and going in the correct direction. Like the scepter of a king, the staff represents the final authority and is welded for the good of the subjects. The picture associated with the letter Hey is that of a person with arms upraised. Immediately, my mind goes to worship, a votary with her hands upraised in praise or supplication. That association is not wrong, either. The immediate translation of Hey is behold, as in calling attention to a great sight. It can also be translated breath or sigh. Revelation or revealing is also understood within this letter. When David used the word selah, he wasn’t just calling for a pause, like a caesura in a stanza. He was saying much more. The entire framework of how David viewed the Lord is written within that first line of Psalm 23: The Lord is my Shepherd. David knew what it meant to be a shepherd. He understood the love a shepherd had for his flock, how a shepherd wanted to make sure the lambs were with their mothers so they could be nourished and grow into healthy sheep. David knew that shepherds were fiercely protective of their flocks. No doubt he constructed a thorn enclosure more than once in his shepherding days, enduring the discomfort of wrestling with brambles and getting scratched and scraped for his efforts. We know that he encountered predators, too. In his youth, he was called on to engage with bears and lions and smite them. He put himself in harms way for his sheep. While they slumbered, he sat up and kept watch. They rested in perfect peace because he was there. They didn’t worry about where they would graze, they simply followed his lead, implicit in their trust of him. They knew if they were frightened, all they needed to do was call out and he would come to their rescue. Because David was a shepherd, he knew the responsibility and the cost of caring for his sheep. He knew the tender love he bore toward them. He knew that their everything rested on his shoulders, and he knew he was the final authority in their lives. Selah is rooted in this understanding of the shepherd. Selah begins with the Hey, as Hebrew is a language that is read right to left. Behold. Breathe. Rest in the authority I have as the Shepherd. I will protect and guide you. Grab hold of me. I am your shield. Lord, I have so many enemies, so many who are against me. You take me and surround me with yourself. for you lift high my head when I bow low in shame. I have cried out to you and from your holy presence. You send me a Father’s help. and I’ll awake in safety for you surround me with your glory. Selah is a reminder: the Lord IS my Shepherd. He protects me. He shields me. Because of His great love for me, He guides me and provides for me. When I am with Him and behold His glorious splendor, I can truly be at rest. Selah is David’s reminder to himself to pause and think on that. 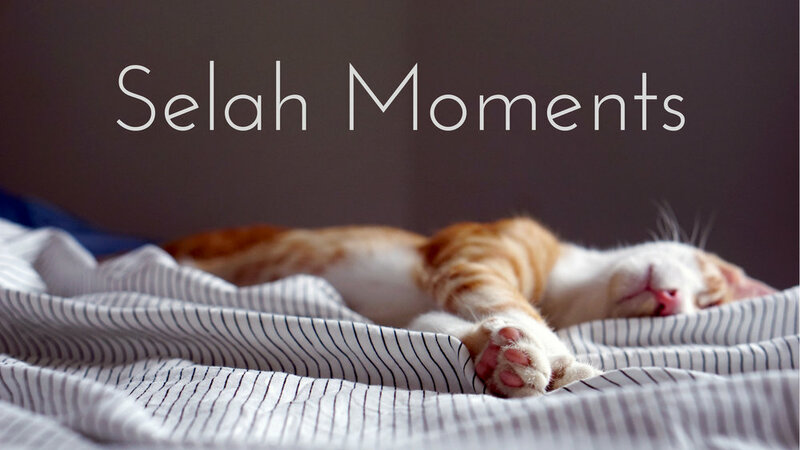 We all need these selah moments. Just like Zucchini when she follows me around the house, we should quest for the selah David talking about. Rest. I’m going to do as David did. I’m going to remind myself of the selah. I’m going to labor to be in that rest and immerse myself in the One who loves me. For He is Love. And in Love there is perfect rest. I’m going to take a page out of Zucchini’s book and be carefree in that Love. Today, dear readers, I hope that you too can take time to rest, to have a selah moment where you bask in that kind of love.